The Arcus Argentariorum (Latin, "Arch of the money-changers", in Italian Arco degli Argentari), is an arch that was partly incorporated in the 7th century into the western wall of the nearby church of San Giorgio al Velabro in Rome, Italy. It is a widespread misconception that it is a triumphal arch, but it is in fact entirely different in form, with no curves and more resembling an architrave. 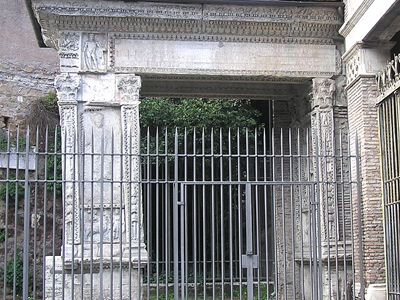 Its actual purpose is unknown, but the most probable scenario is that it formed a monumental gate where the vicus Jugarius entered the Forum Boarium. As the dedicatory inscription says, it was commissioned not by the state or emperor, but by the local money-changers (argentarii) and merchants (negotiantes), in honour of Septimius Severus and his family. The top was possibly once decorated with statues of the imperial family, now long gone. It was finished in 204 and is 6.15 metres (20.2 ft) tall and the passage (between two thick pillars supporting a flat lintel) is 3.3 metres (10.8 ft) wide. It is built of white marble, except for the base which is of travertine. The dedicatory inscription is framed by two bas-reliefs representing Hercules and a genius. 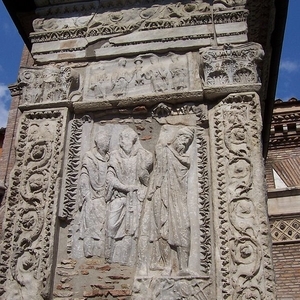 The panels lining the passage present two sacrificial scenes - on the right/east, Septimius Severus, Julia Domna and Geta, on the left/west side Caracalla with his wife and father in law Fulvia Plautilla and Gaius Fulvius Plautianus. The figures of Caracalla's brother, father in law and wife on the passage panels and on the banners on the outside, and their names on the dedicatory inscription, were chiselled out after Caracalla seized sole power and assassinated them. Here's the our members favorite photos of "Monuments in Rome". Upload your photo of Arcus Argentariorum!